Summer Lawn Diseases can be some of the most damaging problems we encounter. Being careful about how we maintain our lawns leading up to the summer months is very important in preventing these diseases. Preventing diseases is always easier than stopping them once they start. The good thing is that modern approaches are much better at solving problems then they used to be. 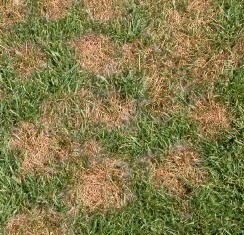 Diseases are common with virtually any grass types. Although they are naturally occurring, how damaging they are can depend greatly on how we manage our lawns. We know that lawns must be carefully maintained. However, if done improperly, we can actually predispose our grass to diseases. Proper cultural practices that hinder disease development is your first line of defense against lawn diseases. Microscopic living organisms are the cause of lawn diseases. They include bacteria, fungi, nematodes, phytoplasmas, and a few other organisms. However, pathogenic fungi are the cause of most lawn diseases. These fungi can remain dormant in the soil until environmental conditions favor an outbreak. They can also be transported to our lawns by wind, foot traffic and from lawn equipment. Since fungi lack roots, stems, or chlorophyll, they get their nutrients from their host. Pathogenic fungi penetrate the host plant when conditions favor the disease. An important fact to be aware of is that infected plant will display specific symptoms and damage that are characteristic of that particular pathogen. Knowing the temperature range they are active in and comparing the symptoms with pictures will help you identify the disease. Three conditions must be met before lawn diseases can begin. There must be a pathogen present in and around your soil. The most important of these is the environmental conditions. It is an almost certainty that pathogens are constantly present in your soil. However, it is a necessity for the environmental conditions to be correct before anything will happen. Your best defense against lawn diseases is to develop the habit of performing sound maintenance practices that discourage them. Read the section on Maintaining Your Lawn to Discourage Disease. Important: The new line of biostimulants, such as AgriGro Biostimulants have proven to fight plant lawn diseases before they start and help suppress them after they have started. For example, they contain hormone, Salicylic Acid, that fights diseases inside the plant. In the plant world, the hormone salicylic acid only develops inside the plant after a disease has penetrated the plan so having it added to the plant before a disease occurs gives it a jump start. There are many other benefits to using AgriGro biostimulants in plant health and growth. Brown patch and large patch diseases are closely related and will cause similar damage. They have two important differences. The two lawn disease varieties generally become active in different temperature ranges. The two varieties often affect different grass species. Brown patch becomes active in warm to hot weather during periods of high humidity. It primarily affects cool season grasses, although it also affects warm season grasses as well. Large patch is a cool weather disease that affects warm season grasses. Large patch is most commonly seen in the spring and fall. 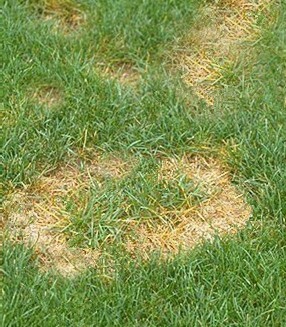 Brown patch, also called "Rhizoctonia blight", has symptoms that will vary slightly with grass species. With closely mown grass, such as bentgrass, affected patches are somewhat circular. They range from several inches to greater than 3 ft in diameter. When environmental conditions are correct, disease symptoms can appear overnight. The patch begins small and becomes larger as the disease progresses outward, forming a larger circle. The grass in the circle becomes blighted and may turn brown. In older disease patches, the center of the grass will often grow back giving it a frog-eye appearance. It is common to see a “smoke ring” on the outer edges of the patch. This blue-gray to whitish ring is the grass’ reaction to the disease as it progresses outward into new grass. The smoke ring often looks water-soaked. In early mornings, when dew is present on the grass, a cobweb like substance can be seen. These "cobwebs", called mycelium is produced by the grass fungus. The smoke ring is not always visible on higher mown turf and infected patches will have more irregular shapes. Brown patch disease begins in the leaf blade. Symptoms include lesions that form on the blade. These lesions appear as tan spots from 1/8 to ½ inch or more in length. The size of the lesions depend on the grass type. Tall fescue has large lesions while ryegrass produces small lesions. They are bordered by a brown to purple band. As long as the disease remains in the blade, the grass will eventually grow out of it. However, if environmental conditions persist, it can spread to the crown. The crown is the live center of the plant, so if the crown is affected, the grass will die. Young lawns less than a year old will usually sustain significant loss. Look for brown patch to become active as overnight temperatures stay above 70 degrees and daytime temperatures above 85 degrees. Moisture is also important for disease development. The most critical time is when humidity rises above 86%. Abundant rainfall or irrigation practices (i.e. night watering) that prolong soil dampness increase the chances and severity of the disease. A key factor in disease development is when the soil remains damp more than 10 hours each day. Large patch disease is a strain of Rhizoctonia solani that affects warm season grass. St. Augustinegrass, zoysiagrass, bermudagrass, and centipedegrass can all be affected. Where you live in the country will determine which grasses are most affected. Large patch is active during the cooler weather of spring and fall when temperatures are between 60 and 75 degrees. Soil moisture to necessary for the disease to activate and progress. Moisture could be heavy dew, abundant rain or frequent, heavy irrigation. Overnight moisture, including nightly irrigation, will encourage disease development. The onset of large patch begins when the grass is at the point of going dormant in the fall or breaking dormancy in the spring. In the spring, the disease remains active until the weather warms above 75 degrees and the soil begins to dry out. In the fall, it is active until temperatures remain below 60 degrees. If you have a dry season, the disease may not occur even if the temperatures are within range. The disease begins as small discolored, circular areas that appear overnight. The grass may have a dark to orange colored ring on the outer edges of the patch. This is the evidence that the disease actively spreading and infecting new grass. Patches could reach sizes greater than 15 feet in diameter. The disease is more aggressive in over-fertilized or over-irrigated turf. The blades of the grass turn brown and die. It will have a sunken-in appearance compared to the thicker, unaffected grass around it. However, the disease will not usually kill the stolons or roots. Since many warm season grasses sprout along the stolons, by mid to late summer, the grass has often grown back and appears healthy again. Large patch will continue to be a problem each year unless measures are taken to stop it. Spots will reappear in the same places as before. Be aware, that it can also be spread when mowing infected grass or transported on shoes, etc. Avoid nitrogen application in spring or fall if you have had previous problems with large patch. Wait until the temperature is consistently above 75 degrees. Do not irrigate in late evening or at night because the cool night temperature and prolonged dampness will accelerate the disease. If irrigation is necessary, water during early morning hours when the dew is still on the grass. Waiting to after the dew has dried only extends the time the soil remains damp. Large patch is more severe on low mown turf. Try to maintain your lawn at the tallest recommended height for your grass type. Fungicides are available for many lawn diseases. For best results, apply fungicides as soon as you see disease symptoms. If you have had problems with large patch before, you can apply fungicides as a precaution. Apply as soon as temperatures are within range for disease activity. Follow the label carefully and wear all protective clothing listed on the label. Some fungicides can be difficult to apply correctly, especially if you are unfamiliar with them. Application frequency varies depending on the type of product. Read the label to see which product is the easiest to apply or the most appropriate in your situation. If you are not certain about how to apply them after reading the label, it is recommended that you consult with the local county extension office for help or hire a licensed professional to apply it. Read Applying Herbicides Safely. Fungicides include Azoxystrobin, Fenarimol, Flutolanil, Mancozeb, Myclobutanil, Propiconazole, Triadimefon. Not all products listed may be available or legal to use where you live. This is not an exhaustive list and other products are available. A product listed here does not constitute an endorsement and is not intended to discriminate against other products. 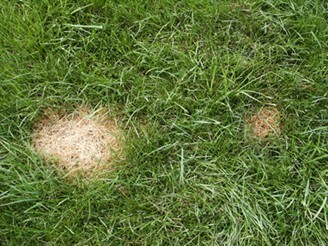 Pythium blight is also referred to as "greasy spot" or "cottony blight" and is one of the most destructive lawn diseases. It attacks mature turf as well as newly seeded or newly sprigged lawns. It strikes during hot weather, especially during periods of high humidity. It is a lawn disease closely associated with water movement, and poorly drained soils. One of the most destructive features of this disease is how fast it progresses. Once the disease becomes active, it can take less than 24 hours to destroy the grass. It occasionally infects home lawns, but it is more of a problem on sports turf. This is due partly because athletic fields and golf courses frequently irrigate at night when no one is there. On mature home lawns, pythium blight is only an occasional problem. Bentgrass, ryegrass, annual bluegrass and tall fescue are the species affected the most. Kentucky bluegrass, fine fescues, zoysiagrass, bermudagrass, and St. Augustinegrass are rarely affected. However, grass seedlings of any species can be affected. On newly seeded lawns, pythium blight can effect any grass species. “Damping off” is a common term applied to seedlings where the grass fungus attacks and starts rotting the grass crown and roots. Cool season grasses that have been seeded in the spring are highly susceptible. Seedlings need frequent, shallow irrigation to place water within reach of their developing roots. Frequently, too much water is applied and when the surface doesn’t have sufficient time dry between each irrigation, it becomes vulnerable to the disease. Grass seed that is spread too heavily in amounts that exceed the recommended rates per 1000/sq.ft. is also at risk. Disease attacks seedling growing too close together due to reduced air circulation and slowed evaporation. Areas most likely to be affected are low places where water collects or where the soil remains damp or wet for more than 10 hours a day. These could be shaded areas, low lying areas and on compacted soils where water sits on the surface. Trees with branches that hang down close to the grass restrict air circulation and compounds the problem. On open lawns, pythium blight tends to follow water drainage patterns. The active fungus can be picked up and transported on mower tires creating long streaks. Mower blades can also scatter the disease infecting larger areas. On saturated ground, the fungus can be spread by flowing water and splashing rain. Look for small, sunken spots from a few inches to a foot in diameter to appear overnight. At the onset of the disease, the grass will appear water-soaked, slimy and feel greasy to the touch. This grass quickly changes to tan or brown as the grass dies and mats down. All this happens in 12 to 24 hours. In the early morning hours when dew is on the ground, a cottony web of mycelium will cover the leaves. This gives the grass a cottony appearance, hence the name “cottony blight”. On newly seeded lawns that have received too much rain, excessive irrigation, or have poor drainage, seedling will wilt, collapse and die. The base of the seedling appears black and rotted. Pythium blight is primarily a hot weather lawn disease, but can have minor outbreaks during cool wet weather. Watch for disease activity during hot, wet or very humid conditions when temperatures are above 85 degrees. When temperatures rise above 90 degrees, the disease can spread quickly covering large areas. Some minor outbreaks can occur in cool wet conditions from fall through spring. Heavy, compacted soils have the most problems, while well-drained soils rarely experience any. Temperatures as low as 60 degrees during wet conditions can produce the disease. The best way to avoid pythium blight is to correct any drainage problems, relieve soil compaction, fill in low spots or redirect water flow. If these conditions persist, they could influence other lawn diseases as well. Trim low hanging branches to improve air flow. Raise the mower blade to the highest height for your grass type. For warm season grasses, remove excessive thatch over 1/2 inch thick. Thatch is able to harbor tremendous numbers of disease causing fungi. Use a dethatcher or core aeration to help relieve thatch. Some problems are not easy to correct. For example, a home I inspected was positioned at the bottom of a hill. On rainy days, the water flowed down the hill and flooded her lawn. With a lot of prodding, she eventually got the city to put up a barrier redirecting the water flow. For her, that corrected most of the problem. Do not over-fertilizer your lawn. Follow a well developed fertility program. Use slow release or an organic fertilizer. This is one of the more common mistakes people make. Many have reasoned that a little fertilizer is good, so more must be better. Over fertilization will make the grass succulent and actually predispose it to many types of diseases. It also encourages thatch development. When lawn diseases do strike, the damage will be much worse. You can always add more nitrogen a little later, but you can’t remove it once it is down. Use proper irrigation practices. Only water as the grass needs it. Irrigate in early morning hours when the dew is still on the grass. Try not to water at night or late in the evening. Prolonged soil dampness encourages many lawn diseases and pythium loves it. By far, it is best to fix the drainage problems or you will continue to have problems with lawn diseases. Unfortunately, there are few homeowner fungicides available for pythium blight in turf. Some of the ornamental fungicides are also labeled for turf, but they are impractical to use. Because this lawn disease strikes so fast, they will do little good to save the infected grass after the disease begins. However, it could stop the progression if applied correctly. Read the label carefully and completely first. Make sure you have all the equipment and personal protection equipment (PPE) before mixing or applying the fungicide. If fungicides are warranted, commercial landscape and turf companies may offer that service. Be sure they understand the disease and when the fungicides need to be applied. This lawn disease gets it name from the silver dollar sized, tan colored spots found on golf course greens. On home lawns, however, the spots will be from 3 to 6 inches in diameter. The sizes of the spots are related to the mowing height and blade size of the grass. Higher mowing height means larger spots. Eight inches is about the maximum size for this disease. The spots are similar in size to animal urine damage and are often misidentified. Several different species of grasses can be affected. Several Kentucky bluegrass varieties are the most severely affected. Bermudagrass, zoysiagrass, fine fescue, ryegrass and bentgrass are also affected. Dollar spot lawn disease attacks low nitrogen turf. If you are having problems with dollar spot, it may be an indication that you need to apply more nitrogen. Infrequent fertilization, use of organic fertilizers with low nutrient content, or soil problems that block the uptake of nutrients can encourage this disease. Remember, always develop and follow a good fertility program. Applying too much nitrogen will predispose the grass to other lawn diseases. Kentucky bluegrass is the grass that can suffer the most damage. The others follow close behind. Spots can appear in large numbers within a few days. 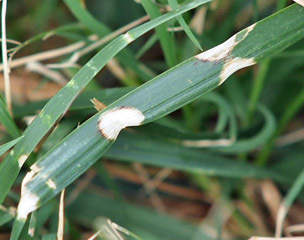 Different strains of the fungi produce different symptoms on the grass blades. Some produce hour glass lesions bordered by a purple band. These lesions form at the center of the blade. Others will not have the lesions, but will begin to turn brown from the tip down. The roots and lateral stems (rhizomes and stolons) are not invaded by the grass fungus. However, the roots can be damaged from toxins produced by the mycelium produced by the fungus. The grass will shed the injured roots (along with any stored nutrients) and replace them with new ones. Unfortunately, the new roots will encounter the same problems. The grass starves because it loses the ability to produce and store nutrients. If it wasn’t for these toxins, the grass could grow out of it without suffering permanent damage. These small spots can multiply rather quickly. The disease can be spread by mowing or from foot traffic through the lawn. In severe cases, spots can coalesce forming highly irregular shaped patches up to several feet in diameter. Generally, this lawn disease is not severe if it is caught soon enough. A light application of water soluble nitrogen, such as ammonium sulfate, will encourage blade growth. Blade growth may outpace disease development and the quickly available nitrogen will slow disease progression. Don't wait too long or the grass will be too damaged and will need to be reseeded. Reseeding with a resistant variety will help considerably. Grass that is under stress is more likely to get the disease. Grasses that are low in nitrogen means that the grass is struggling to produce chlorophyll and carbohydrates. It will, therefore, have a lowered ability to fight off the disease. Work to maintain a balanced fertility program without over-fertilizing. Over-fertilization may lead to other lawn diseases. Prolonged dampness with water collecting on the blades can lead to severe outbreaks. Periods of high humidity under heavy cloud cover, frequent rain or drizzle, watering late n the evening or at night can keep moisture on the grass surface for extended periods. Grasses secrete sugary fluids onto the grass surface called guttation fluid. When fungi consumes this sugar, it accelerates the outbreak. During hot, humid days, wash the grass off with a quick blast from a water hose. Don’t over-water if the grass doesn’t need it. Water just enough to remove the dew and sugar from the surface. This has been a successful practice on golf courses and sports fields when lawn disease pressure is high. Don’t set the sprinklers to come on daily. Water only when the grass is in need of it. Water deeply so the soil is wet down to 3 to 4 inches. Shallow watering promotes shallow rooting and the grass becomes easily stressed during hot, dry weather. If you develop a balanced fertility program, you will probably have little need for fungicides. Fungicides are usually not recommended for home lawns, but are reserved for high dollar, high profile turf. However, for severe home lawn disease outbreaks, an application of a fungicide may stop the progression. 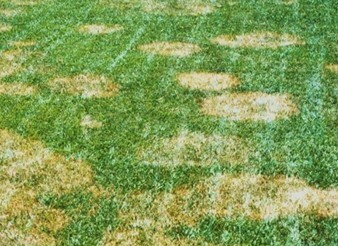 Dollar spot is one of the lawn diseases that have demonstrated resistance to certain fungicides. A fungicide may work at one time, but not another. Resistance is usually caused when the same product is used too frequently instead of rotating use with other fungicides. Chlorothalonil was a popular fungicide, but is no longer allowed for lawn use. Try Mancozeb by Fore or propiconazole by Banner Maxx. Read the label carefully and follow directions completely. Please consult your local county extension office for more help, if necessary.Licensed commercial applicators, that specialize in lawn maintenance, have access to products not available to homeowners. Summer Patch is primarily a disease of Kentucky Bluegrass lawns that is at least two or three years old. It doesn’t affect bluegrass in the seedling stage. It will also affect annual bluegrass and creeping red fine fescue. It may also affect bentgrass, but to a much less extent. Summer patch is difficult to diagnose by symptoms alone. It acts similar to pythium blight in that it attacks the crown and roots. Most field diagnoses are made by observing the type of grass affected. Since Kentucky bluegrass is often mixed with other grasses, summer patch will be suspected if only the Kentucky bluegrass is affected, but not the other types of grasses growing with it. Summer patch was once grouped together with necrotic ring spot disease. Together, they were grouped under a disease complex called Fasarium Blight. These diseases are now separate, but have similar symptoms. A couple months may lapse between the time the grass is infected and when the actual symptoms appear. It may infect the grass in spring, but will wait until summer when the grass becomes heat and drought stressed before symptoms appear. The disease seems to be most prevalent following a wet spring into early summer. Look for disease symptoms to appear as temperatures rise above 90 degrees. The disease is most common on the sunny side of slopes. Areas that heat up quickly, such as the edges of roadways, driveways, sidewalks, etc. are also places where the disease is known to start. Allowing Kentucky bluegrass to go dormant during summer drought will produce the most severe damage. Proper water techniques will help lessen the damage. Early symptoms of this lawn disease will be patches of wilted, dark green grass that quickly turns brown. You may see a weak gold to copper colored smoke ring along the edges of the patch. This ring is a sign that the lawn disease is spreading and infecting new grass. The initial size of the patch is small, but increases in size. As the size increases, they may take on circular shapes to elongated streaks. A common characteristic of this lawn disease is the “frog-eye”. A frog-eye is a patch of green healthy grass growing in the center of a larger brown dead patch. Although common, not all affected areas will produce the frog-eye symptom. Why a frogeye? The center of each patch is where the disease first began. Since it is the oldest part of the disease patch it will be the first to recover, if it recovers at all. Low cut grass below 2 inches high accelerate and worsen the disease. It is best to mow at the highest recommended height for your grass type in your area. Kentucky bluegrass can be maintained at 3 to 4 inches. Frequent, shallow irrigation is not good for the grass and will worsen the disease. Always irrigate deeply to where the soil is moist 4 inches deep. This encourages deeper root development and lengthens the time between each watering cycle. Over-fertilized lawns will increase disease damage. Most Kentucky bluegrass common varieties become disease prone when placed on a regular fertility program. Even at 2 or 3 lbs per 1000/sq.ft. per year could predispose the grass to disease. Light fertilization using a slow release fertilizer is better. Improved varieties of bluegrass are not as disease prone. Contrary to popular belief, fungicides don’t always eradicate all targeted pathogenic fungi. Instead, they reduce populations to manageable levels. Therefore, this lawn disease cannot always be controlled using fungicides. It will help reduce disease severity, however. Fungicides should be applied in spring about the time the disease starts to infect the turf. Once the disease shows symptoms during the summer, it is much more difficult to control. Different products will have different application methods. Find the product that best suits you. Not all of these products are available to homeowners. It may be recommended to have a licensed professional apply the product for you. It you wish to do it yourself, read the entire label first before opening the container. If needed, consult your county extension office for specific information about what works best in your area. Review the page on Using Herbicides Safely for information on safe handling of chemicals. Lawn diseases are a frequent problem on home lawns. Poor maintenance practices can actually predispose our lawns to disease. Click here for proven cultural practices that discourage disease growth. 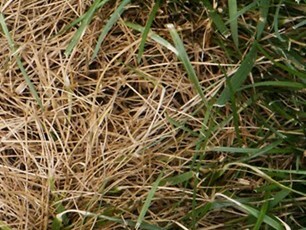 Profiles of common spring and fall lawn diseases. Learn what they are, recognize disease symptoms, how to prevent them, treatment options and more. Never used a fungicide? While cultural practices are the best way to prevent diseases, you may someday find it necessary to use a fungicide. Knowing what they are and how they work is important for successful disease control. This page is loaded with useful information about safely handling all types of lawn chemicals. It covers everything from label instructions to personal protective equipment and much more. Compost has many benefits including a source of nutrients. The right blend of organic compost also has a tremendous ability to suppress grass diseases. Find the specifics on what the compost should include, how much to apply and information on how to make it yourself.